Although we did not come close to achieving those impossible ideals, still the atelier has always repaid us. It has, as desired, proved to be subversive – generating complexity and new tools of thought. It has allowed rich combinations and creative possibilities among the different (symbolic) languages of children. Our children's school has a small art gallery. 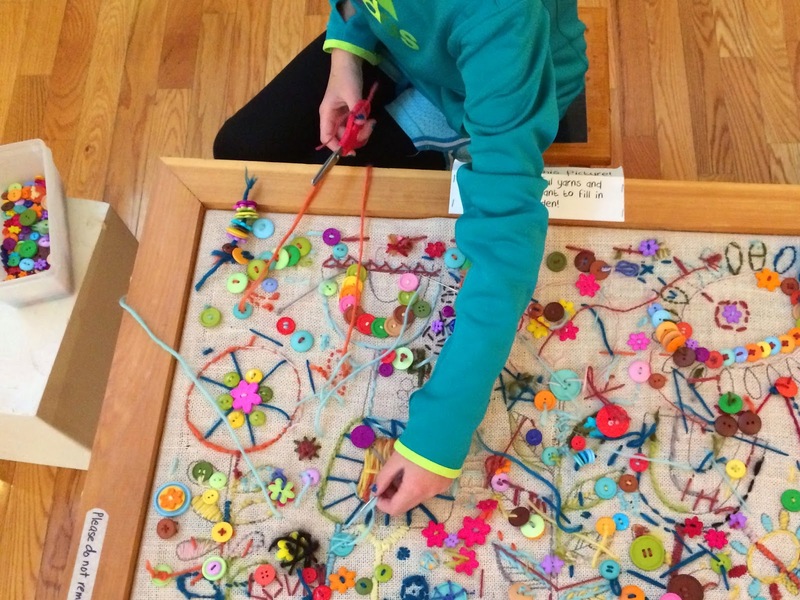 And currently, in the gallery is an exhibit where students, teachers, and families can spend time creating, making their own art, adding to the work left behind by others, using the space and the materials beautifully displayed and prepared to explore art together. We have spent a great deal of time in the exhibit, so perfectly does it allow us to spend brief moments waiting for a sibling here, passing a few in between minutes there, alone and with one of my children. The kids can show us what they have done during visits with their classes and friends. And we can continue something that was started by another, or return to something we began a few days before. 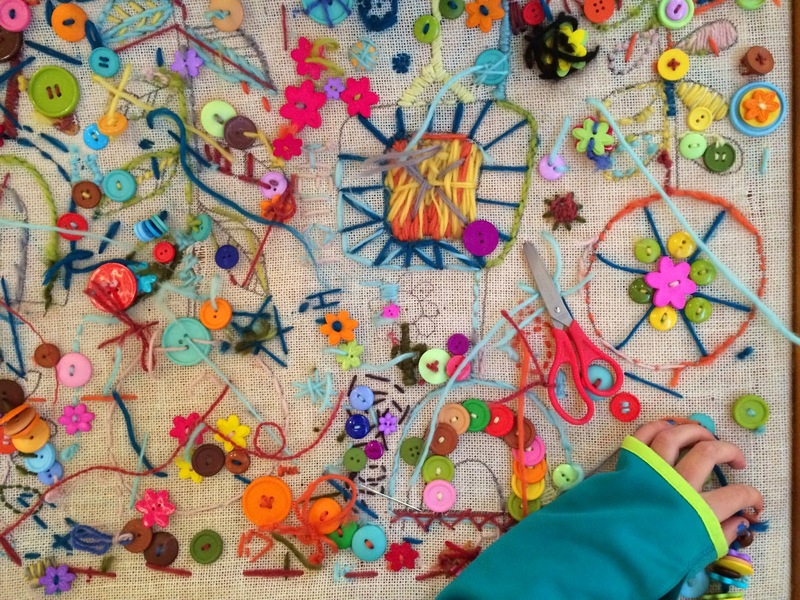 With the colder weather upon us, and the days upon days of rain this week, we have been feeling the need to nest, tidy, bring out the indoor activities and art supplies and games that have sat neglected for months, while we were outdoors playing in the dirt. There was much that needed to be sorted and tamed. I handed Jonathan this knotted ball of embroidery floss the other night while he was on a Google Hang Out and whispered, do you need this? As a metaphor for something? I am finding myself leaving collections of carefully chosen materials, sorted and ordered here and there. Always near the woodstoves. To see what they decide to create with them. And what I will create with them. We will never be as tidy as the art gallery. But there is good stuff pouring out already. And months and months ahead of us for more possibilities and expressions. But what I find, as I walk around our inside space and look at the bits and pieces left behind, is that sometimes, the mess? It's necessary. And just as beautiful, with its complexities and struggles and workings apparent, as the intended result.